Weekly mortgage payments Vs. monthly. A cautionary note about mortgage lenders. If you want to see what the weekly payment would be on a new mortgage, enter the new mortgage amount. If you have an existing mortgage and want to see how much you could save by switching to a bi-weekly or weekly payment, enter the original mortgage amount. Enter as a dollar amount without the dollar sign and commas. Enter the term of the new or original home loan in number of years. If this is an existing mortgage, enter the number of monthly payments you have already made. If this is a new mortgage, enter a zero or leave blank. If you would like to see how adding an extra weekly amount would affect the payoff time and interest savings, enter the amount here. Note that it may help to calculate the weekly payment amount and savings without an extra payment first, and then if it appears you can afford an extra weekly amount, come back to this field enter the amount you can afford and recalculate. Based on your entries, this would be the weekly payment for a new mortgage with the entered terms. Note that is for new mortgages and therefore does not account for any payments made on an existing mortgage. Based on your entries, this would be the total interest cost of a new home loan based on making weekly mortgage payments. Note that is for new mortgages and therefore does not account for any payments made on an existing mortgage. This column displays the payment, number of months remaining, total interest cost, and estimated payoff if you continue making 12 monthly payments per year. The monthly payment is calculated based on the original mortgage amount, the annual interest rate, the original term, and the number of payments already made, and therefore does not include escrowed taxes or insurance. This column displays the payment, number of months remaining, total interest cost, and estimated payoff if you start making 1/2 of your monthly mortgage payment every two weeks. These 26 biweekly payments equate to 13 monthly payments per year instead of just 12. The biweekly payment is calculated by dividing the monthly payment by 2. This column displays the payment (including any extra amount you entered), number of months remaining, total interest cost, and estimated payoff if you start making the equivalent of 14 payments per year by dividing the total of 14 monthly payments by 52 weeks (plus any extra amount you entered). This column displays the time and interest savings that will occur if you switch from making 12 monthly payments per year, to dividing the total of 14 monthly payments by 52 and paying that amount on a weekly basis -- plus any weekly extra amount you entered. This calculator will calculate the weekly payment and associated interest costs for a new mortgage. 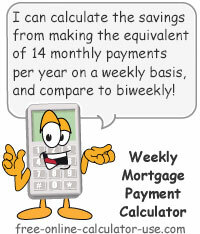 Or, if you are already making monthly house payments, this weekly payment mortgage calculator will calculate the time and interest savings you might realize if you switched from making 12 monthly payments per year, to making the equivalent of 13 or 14 payments per year on a bi-weekly or weekly basis. Plus, I recently added a field wherein you can enter an optional, extra weekly payment amount to be added to the calculated weekly payment amount. You'll be amazed at how much a small extra amount per week can save you in time and interest over the long run. Finally, I have also recently added an "Estimated payoff date" row to the comparison results so you can immediately see the month and year each payment interval will pay off the mortgage. Enter either the original or the new mortgage principal amount borrowed. Enter the term of the mortgage in number of years. If this is for an existing mortgage, enter the number of mortgage payments you have already made. Otherwise, if this is a new mortgage leave this field blank. If you would like to speed up the payoff of your mortgage, enter an extra amount that you could add to each weekly payment. Click the "Calculate Weekly Mtg Payments" button. This will populate the payment interval comparison chart and display a chart showing the annual balance of each interval. How weekly payment amounts are determined, how they save you money, and a cautionary note. If you simply enter the terms for a new home loan into the weekly mortgage payment calculator, you will note that you may only save a couple of hundred dollars by choosing to repay the home loan using weekly mortgage payments vs. monthly mortgage payments. This is because the annual total of your weekly mortgage payments will be close to the same as the annual total of your monthly payments. In order to save a large chunk of time and interest, you need to increase the annual total of your payments. One way to do that -- while hardly noticing the increase -- is to simply make 1/2 of your monthly house payment every two weeks. This will result in making 26 bi-weekly payments per year, which is the equivalent of making 13 monthly payments per year instead of 12. Now you would think that we could double the savings if we use the same process to switch from monthly payments to making weekly mortgage payments. However, if you divide your monthly payment by 4 and pay that result on a weekly basis, you will see that the annual total of your 52 weekly payments would be identical to making 26 bi-weekly payments. The above formula is the one used by the weekly mortgage payment calculator on this page, which results in making the equivalent of 14 monthly payments per year. Since switching to weekly payments results in the prepayment of principal ahead of the original home loan terms, there are numerous, unscrupulous mortgage companies out there that take offense to you cutting into the massive year-end bonuses they have promised to their executives. While some of these companies will simply escrow your prepayment and apply payments as they were scheduled (giving you "the finger" for your early payoff attempt), the more dastardly among them will go so far as to charge you a penalty for prepaying the principal. In any case, before you start making weekly mortgage payments, be sure to check with your home loan company to make sure your principal prepayments will be applied to the balance as you make them -- free of any prepayment penalties.